Laudetur Iesus Christus! We are nearly halfway through Lent, and it serves as a good reminder to promote our first diocesan Traditional Latin Easter Triduum (Holy Week), hosted by St. Ann’s at Charlotte Catholic High School. These liturgies are being generously offered by St. Ann’s for the Latin Mass faithful – please try to attend some or all of them (we’d like this to be annual!). All liturgies will offered by Father Barone at Charlotte Catholic High School Chapel, 7702 Pinesville-Matthews Road, Charlotte NC. 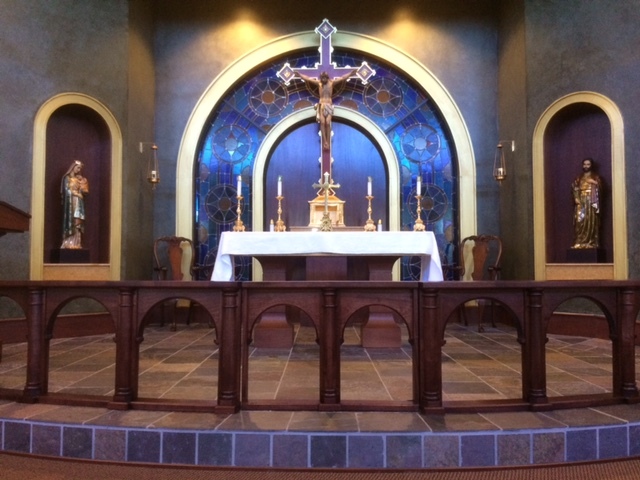 Lastly, in preparation for the Triduum, we share with you a picture of the “tradification” of the Charlotte Catholic High School chapel – altar rails were just installed last week. The free-standing altar will be relocated for the Triduum and a temporary traditional altar will be established — a modest “brick-by-brick approach” toward restoring tradition in this corner of the world.